We’ll be the first to admit that a winter in Gilbert, Arizona doesn’t typically involve temperatures below freezing and snow falling from the sky. In fact, the need for winter boots and earmuffs is highly unlikely (unless you’re heading up to Flagstaff for the Arizona Snowbowl). However, Gilbert incurs the same dry, cold air you experience in other colder regions of the U.S.
Continue reading for a thorough explanation of how lower temperatures negatively affect the skin, and why you should consider altering your skin care regimen during the colder season. How Does Cold Air Affect My Skin? It’s simple: cold air weakens the skin’s ability to retain water. During winter, the amount of relative humidity drops significantly, and low levels of relative humidity make it difficult for your skin to retain moisture and stay soft. Arizona is already known for its dry heat, but colder temperatures make the air even drier! On top of that, escaping chilly temperatures by warming up indoors will only worsen the symptoms of dry skin. Once your skin is exposed to toasty temperatures after being outside in the cold, the moisture in your skin evaporates and causes a tight, dry feeling. If you live in Arizona, you probably experience this on a yearly basis. Never scratch dry skin. People who scratch can potentially worsen existing skin conditions, such as eczema or psoriasis. Whether you currently have a skin condition or not, you should always take good care of your skin. A proper skin care regimen can prevent skin conditions that are caused by dry skin and have you looking younger, longer! Here are some skin care tips that will keep your skin looking smooth and feeling soft during winter in the Valley. Keep in mind that the moisturizer you use during summer may not be as beneficial during the cooler seasons. As we mentioned before, there are lower levels of relative humidity in the air when the temperatures are colder. Therefore, during the cooler seasons your moisturizer needs to seal water in the skin and preserve the moisture. This may seem less important to you during summer if you’re prone to sweating a lot. We suggest using an oil-based moisturizer during winter. Ointments and heavy creams that are oil-based create a protective layer on the skin that locks in moisture to keep your skin hydrated. Make sure you also apply your moisturizer after every bath or shower when your skin is still slightly damp. There’s nothing like a steamy hot shower after a cold winter day, right? Not quite. Unfortunately, a hot shower can strip your skin of its natural oils, especially if you enjoy taking long showers while singing your favorite tunes. Use warm water—showering with warm water helps your body retain more natural oils compared to hot water. Without your skin’s natural oil barrier, any moisture will be easily stripped away. Limit your time bathing—the longer the shower, the faster your skin will lose its moisture. Keep your showers between 5-10 minutes to avoid a total loss of moisture and an unwanted gain of itchy, red skin. Use a gentle cleanser—avoid using harsh soaps with chemicals that can dry out the skin. We suggest using a mild soap that moisturizes as well as cleanses. This way, you can get clean without getting dry. A humidifier is a device that emits water vapor to increase the level of moisture in the air. As you’ve learned from reading, humidity plays a large role in keeping your skin healthy and hydrated. The increase in humidity provided by a humidifier helps skin retain moisture. Although humidifiers provide the greatest relief during the winter season, drier climates, such as Arizona, can benefit from them year round. Don’t forget to clean your humidifier. Forgetting to do so encourages the growth of bacteria that could be harmful to your health if inhaled. Support the loss of moisture during the winter by staying hydrated! Although the state of someone’s skin isn’t solely based on how much water they drink, someone who is dehydrated will clearly benefit from an increased intake of fluids. Dry skin causes dead cells to build up on the surface of the skin, and picking at dry skin that flakes or peels is not just a bad habit, but can also cause sores and blisters that are prone to infection. Exfoliating helps remove the buildup of dead cells, so that moisturizers can penetrate the skin more deeply. You can exfoliate your skin anywhere from head to toe, but be careful as some parts of the skin are more sensitive than others. There are a variety of different exfoliating tools you can combine with an exfoliating cleanser to combat dry skin and reveal a smoother, softer texture. Initially, you may not think that exfoliating is good for dry skin. But the trick is to not over-exfoliate, and to instead scrub lightly. Over-exfoliating promotes dryness, and intense scrubbing can lead to sore skin. Harsh winds can do a number on your skin. But instead of staying cooped up inside all day, you can enjoy the cooler weather by covering up with winter clothing. A winter in Arizona may not always call for warm cotton gloves and a thick scarf, but these items can help block the cold air from pounding against the skin and stripping your skin’s natural oils. Use softer fabrics such as cotton or silk. These types of fabrics don’t rub against your skin, causing irritation and itchy areas. Clothing made from wool or synthetic fibers aren’t a good option for people with sensitive skin, though they can be worn with a softer shirt underneath to act as a barrier between the other material and your skin. Dry, itchy eyes can be a bother, and cold air can irritate them even more. Sensitive eyes easily dry out in the winter, which can cause them to turn red and constantly itch. Windy weather only makes matters worse. We recommend keeping a bottle of eye drops on-hand, so you can refresh the eye with liquid medication. Block cold breezes with sunglasses. Sunglasses can reduce the amount of cold air hitting your face, so your eyes remain lubricated and itch-free. Don’t let dry skin be a part of your winter forecast. 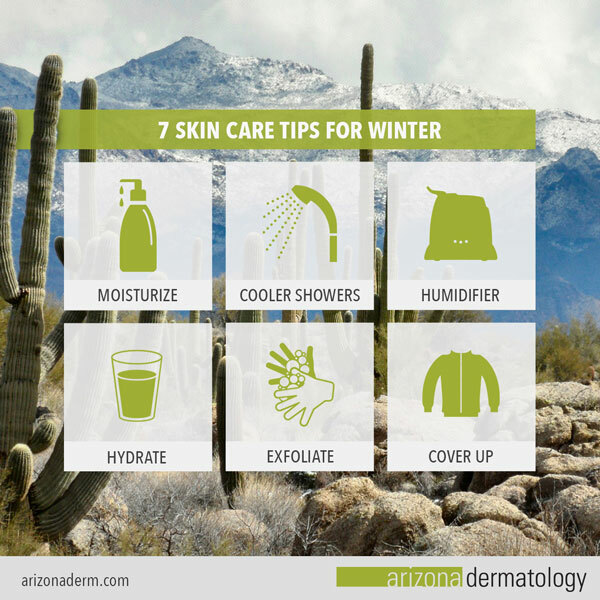 Follow these 6 skin care tips for winter and enjoy the cooler season in Arizona, while it lasts!